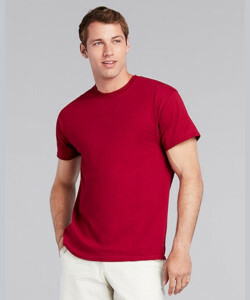 - Gildan® Adult 5.3 Ounce Heavy Cotton™ T-Shirt. 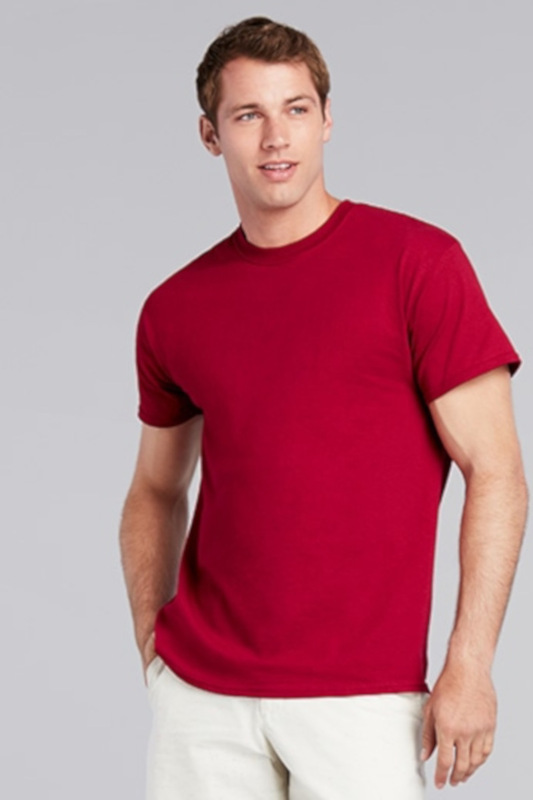 Gildan® Adult 5.3 Ounce Heavy Cotton™ T-Shirt. 100% cotton 5.3 ounce tee. Taped neck and shoulders. Double-needle stitched sleeve and bottom hems, quarter-turned body. Seamless double needle 7/8" collar. Tearaway label. Sizes S-3XL: Colors: Antique Irish Green (90/10), Antique Orange (90/10), Antique Sapphire (90/10), Berry, Blackberry, Brown Savana, Cobalt, Cornsilk, Lilac (50/50), Midnight (50/50), Neon Blue (50/50), Neon Green (50/50), Old Gold, Russet (50/50), Safety Pink (50/50), Sunset (50/50), Turf Green. Sizes S-5XL: Neutrals: White, Natural. Heathers: Ash Grey (99/1), Sport Grey (90/10). Colors: Antique Cherry Red (90/10), Antique Jade Dome (90/10), Azalea, Black, Cardinal Red, Carolina Blue, Charcoal, Coral Silk, Daisy, Dark Chocolate, Dark Heather (50/50), Electric Green, Forest Green, Garnet, Gold, Graphite Heather (50/50), Gravel, Heather Military Green (50/50), Heather Navy (50/50), Heather Radiant Orchid (50/50), Heather Red (50/50), Heather Sapphire (50/50), Heliconia, Ice Grey, Indigo Blue, Irish Green, Kiwi, Light Blue, Light Pink, Lime, Maroon, Military Green, Mint Green, Navy, Orange, Purple, Red, Royal, Safety Green** (50/50), S. Orange (50/50), Sand, Sapphire, Sky, T. Orange, Tennessee Orange, Tropical Blue, Tweed (50/50), Violet, Yellow Haze. **ANSI/ISEA 107-2010 High Visibility certified for use as background material.